Artnet Auctions has announced Shadow Catcher: Vintage Prints by Edward Curtis, a group of ten of Edward Sheriff Curtis' vintage masterprints from a major private collection, is open for live bidding now through Sept. 28. Edward Sheriff Curtis. 'The Scout -- Apache' (1906), rare 5.5 x 7.5-inch gelatin silver print with duotone border, signed and copyright credit in ink. 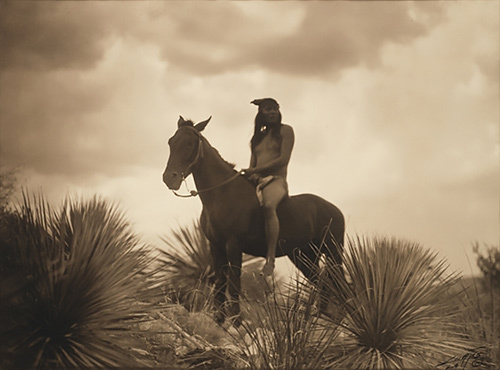 The photographs represent some of Curtis' most important images, captured as he traveled the American North and Southwest documenting Native American culture, religion and mythology at the turn of the 20th century. The images in this collection are available in the photographer's original platinum orotone and silver prints and each remains in its original, aesthetically desirable vintage frame. Edward Sheriff Curtis (American, 1868-1952) was an ethnologist and photographer of the American West, well known for his images of Native Americans. Born in rural Wisconsin, Curtis built his first camera in 1880 and taught himself photography. He then apprenticed for a photographer in St. Paul, MN, before his family relocated to Seattle, Wash., where Curtis eventually established his own studio with his partner Thomas Guptill.